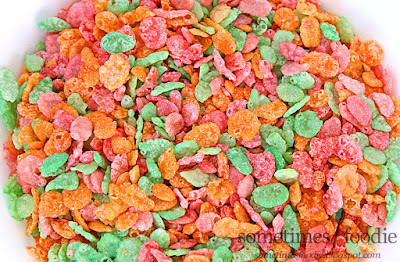 Sherbet flavored Fruity Pebbles. That sounds awesome, right? It totally does, but I have a little bone to pick with it. Rainbow Sherbet is NOT an ice cream flavor. If you want to get technical about it, yes, sherbet does have a tiny amount of diary in it (unlike sorbet which has no diary in it what-so-ever), but that doesn't make it "ice cream." Don't get me wrong, I love sherbet, but in my mind it isn't comparable to ice cream. I imagine it in a league of it's own. 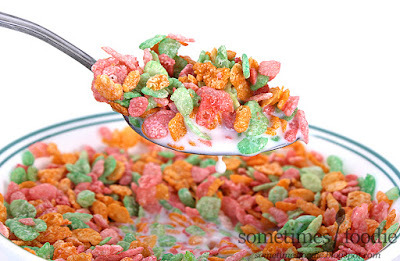 It might be a bit of a misnomer, but I love the idea behind this cereal. (Although I'm a little worried it'll just taste like normal Fruity Pebbles, and that this is just a color-swap and re-brand of the product we already know and love.) Still, I have high hopes for this one. The packaging is bright and colorful, similar to the Cupcake Pebbles I reviewed several years ago, and I absolutely love it. In Typical Pebbles cereal fashion, we have Bam-Bam smashing the cereal bowl with a giant scoop of sherbet and...wait. Where's Pebbles? I mean, this is Fruity PEBBLES after all, shouldn't she be on here? Also the back panel of the box is totally unrelated to the Flintstones, and it's drawn in a different art style. I feel like that's really weird and out of place, but I don't know if children even know who the Flintstones are anymore. (Do any of you have young kids? Let me know if they do. I totally missed my opportunity to poll the kids at the daycare.) 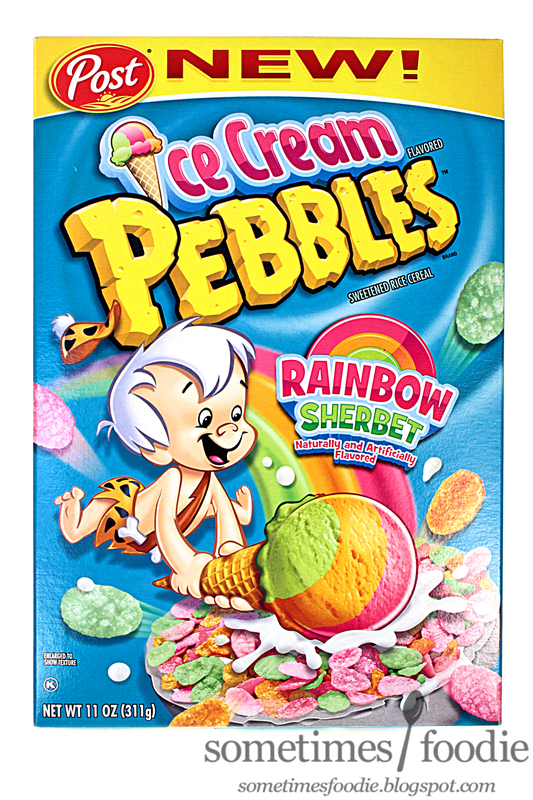 Maybe Pebbles cereal is becoming more of a food product than it is a commercial tie-in with a TV show. Anyway, enough rambling about sherbet's ice cream legitimacy and the Flintstones relevancy, let's open this box up! As soon as I opened the plastic bag I could smell the familiar citrus-heavy blend of rainbow sherbet. There's hints of orange, lime and raspberry mixed with a subtle creaminess. This is amazing! I wish I could bottle this and wear it as a perfume or lotion. (Then again all of my perfumes are candy or food themed, so that's nothing new.) This stuff just smells so freaking delicious! If it tastes even half as good as it smells I'll consider this well worth the buy. For starters I tried some of it straight from the box (dry), since I feel like milk always ruins the flavor of the Pebbles brand cereals. As-is, it doesn't taste as intense as it smells, but the flavoring is pretty darn sherbet-like. It's bright, citrus-y, a little creamy, and there's even a hint of raspberry. It's slightly more intense than normal Fruity Pebbles, and if I were eating this blindfolded, there's a good chance that I would guess that this was rainbow sherbet flavored. It's pretty good, although I did notice that it leaves a citric acid tanginess on the sides of my tongue. It's not terribly noticeable or unpleasant, but I figured it was worth noting. Now, how does it hold up to milk? I added milk and, as usual, that makes the flavor a lot weaker, but it's still pretty accurate. The milk amps up the creaminess, obviously, but the fruity flavors are still present. It's not as obviously sherbet flavored this way, but it's still really enjoyable and I like it a lot! 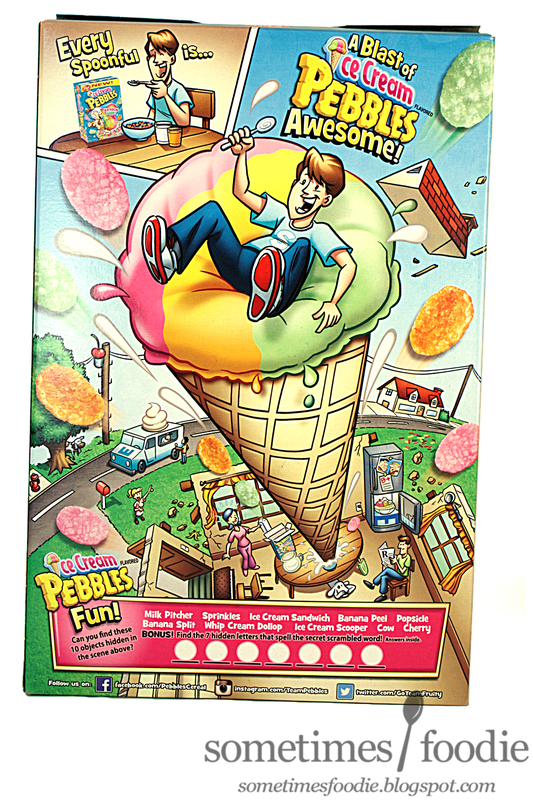 Rainbow sherbet has been gaining popularity as a flavoring for other products. Two years ago we had these limited edition Oreos, and the year before that there was a Dessert Delights gum. Out of these three sherbet flavored products, I think this is my number one! I'd definitely buy another box, but I won't be eating it as a breakfast cereal. I think this would make amazing cereal bars, and I bet it would be a great topping for ice creams and frozen yogurt! If you're into citrus-y sweets, this stuff is pretty amazing, I'd definitely recommend it. Do you think it's safe to say, that i don't need to try them, 'cause i never got the idea of the mixed fruit flavor cereals and never thaught they taste good or fruity? 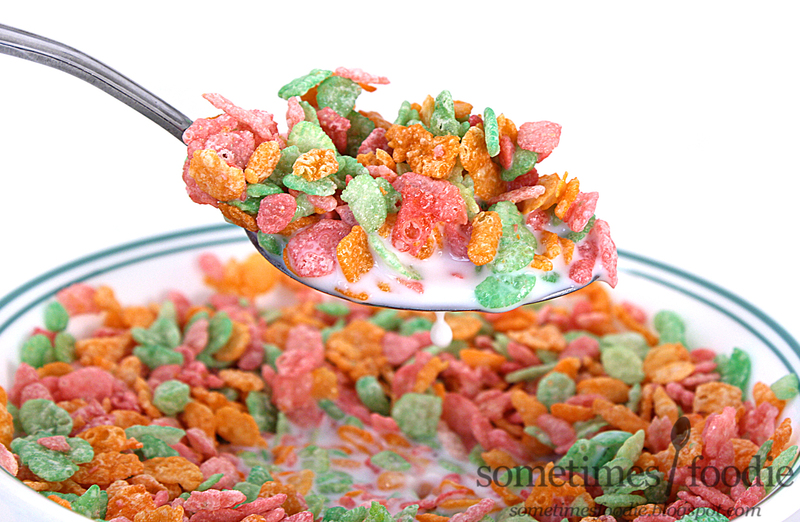 Fruity Pebbles is similar in texture to cornflakes, but a bit softer, so they get soggy very quickly in milk, and if you're not a fan of fruity flavorings, I think you best stay away from this line.